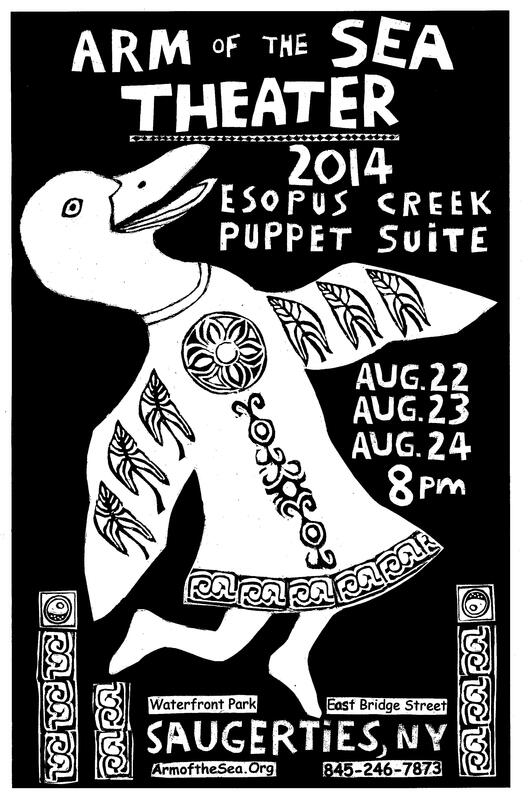 Click photo to view Video Collage from the 2018 Esopus Creek Puppet Suite. Video by Kira deCoudres. Photo by Jim Peppler. Copyright Jim Peppler/2018. Our Story takes place in mythic time on Esopus Creek in Saugerties amidst the ruins of the Sheffield Diamond Paper Mill. Following the mill’s demise in the 1960’s, a dense thicket of trees and vines grew to shroud the site, providing a hide-away for generations of local kids. Like this play, their copious spray-paint hieroglyphics mark tenuous passage through a ruining and rising world. 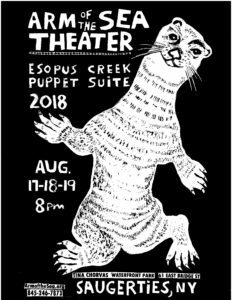 ARM-OF-THE-SEA THEATER’s 2018 Esopus Creek Puppet Suite takes place this weekend – Fri. Aug 17, Sat. Aug. 18 and Sun. Aug. 19 at 8pm. DUE TO UNSTABLE WEATHER, THE PERFORMANCES ARE PRESENTED AT ST. MARY CHURCH HALL, 23 CEDAR ST., SAUGERTIES, NY. This hometown spectacle, inspired by local history and current events, features Marlena Marallo’s hallmark visuals and original music by Rhys Ellis, Dean Jones, Dina Peone & Eli Winograd. View promo video HERE. Admission by donation: $12 Adults, $5 Kids, $25 for family of four. Proceeds will benefit Arm-of-the-Sea’s waterfront revitalization project, The Tidewater Center for Arts & Science. 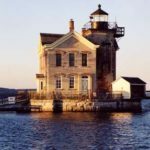 This event made possible, in part, with support from the County of Ulster’s Ulster County Cultural Services and Promotion Fund, administered by Arts Mid Hudson. The Esopus Creek Puppet Suite is our annual hometown summer spectacle presented at Tina Chorvas Waterfront Park in the Village of Saugerties, NY. This year we’re putting a new spin on the event by presenting a three-night PUPPET SUITE RETROSPECTIVE, featuring three works from the company repertoire. All three productions combine visual storytelling with live music in a homegrown style of magical realism. 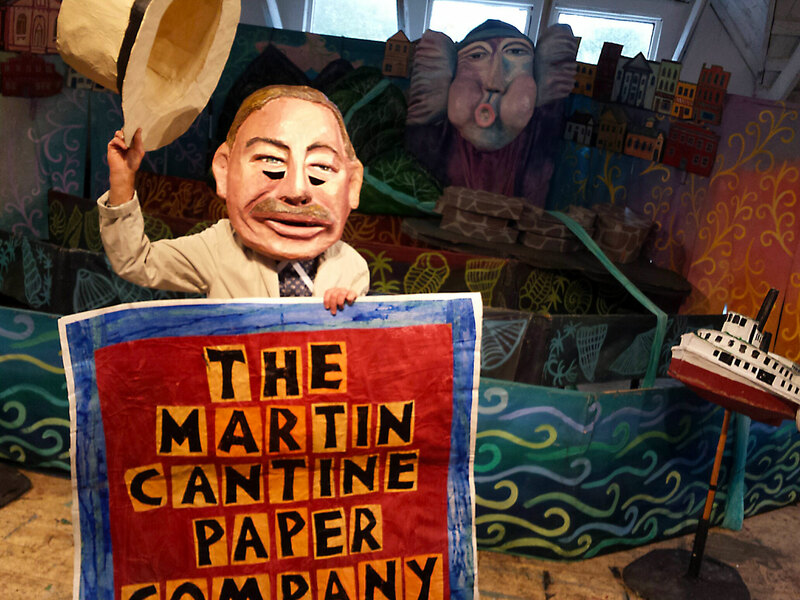 “Puppet theater is a venerable art form that’s enjoying a surge of popularity right now,” reflected Arm-of-the-Sea co-founder Patrick Wadden. “By offering a different show each night, audiences can see a range of our recent work and compare notes. On top of that, we’d like to attract new fans to this style of theater—– so the opening night is free!” Each evening will begin with several short works, followed by the featured production. The multi-layered pieces are designed to enchant oldsters and youngsters alike. 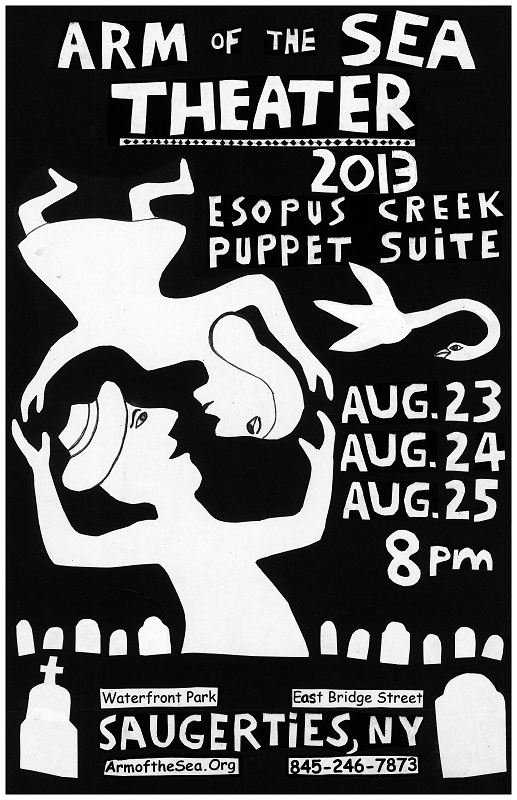 Anna Haffner, Patrick Wadden and Soyal Smalls in a prelude from the Esopus Creek Puppet Suite August 20, 2016. Photo by Jim Peppler; Copyright Jim Peppler 2016. The featured production on Friday August 19 will be HOOK, LINE + SINKER, which celebrates the timeless art of fishing while giving the lowdown on Hudson River fish. Saturday August 20 will feature THE REJUVENARY RIVER CIRCUS, an allegorical tale about the life of a river. On Sunday August 21 the troupe will present CITY THAT DRINKS THE MOUNTAIN SKY, the epic story of water for New York City. All shows feature Marlena Marallo’s stunning visuals. Company performers include Soyal Smalls, Anna Haffner, Laura Kopczak, Dean Jones, Eli Winograd and Patrick Wadden. 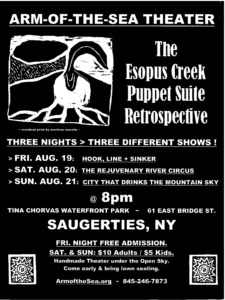 The Esopus Creek Puppet Retrospective begins at 8 pm at Tina Chorvas Waterfront Park on East Bridge Street, in the village of Saugerties. Admission is free on Friday Aug. 19. Admission on Saturday and Sunday is $10 for adults, $5 for children and $25 for a family of four. Tickets are available at the park entrance each evening of the event. Audience members are encouraged to arrive early and to bring lawn seating. Members of the Youth Brigade play the Frogs, the Millworkers, the River, the Wolves, the Deer, the Circus Troupe and the Firemen. The Brigade is Ava Cooper, Hannah Cooper, Allie Joers, Nickie Joers, Sophia Kamrass, Monika Berlinska-Glasser & Miles Berlinska-Glasser. Special thanks to: Saugerties Mayor Bill Murphy and the Village trustees and staff, Deborah Conathan, Rae Stang, David Radovanovic / WhatsTheBigIdea, Susannah Kricker, Tina Piccolo, Steve Thomas, Dana Schildkraut, Patrick & Anna Landewe and the Cantines Island Co-Housing Community. Arm-of-the-Sea sponsored a mini Art & Science Camp this week in Saugerties at SebSi Studio. Initiated and directed by board member Marie Daniels, the camp involved nine young people and focused on frogs. 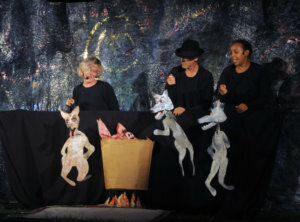 They will present a short performance at the Friday evening Puppet Suite. 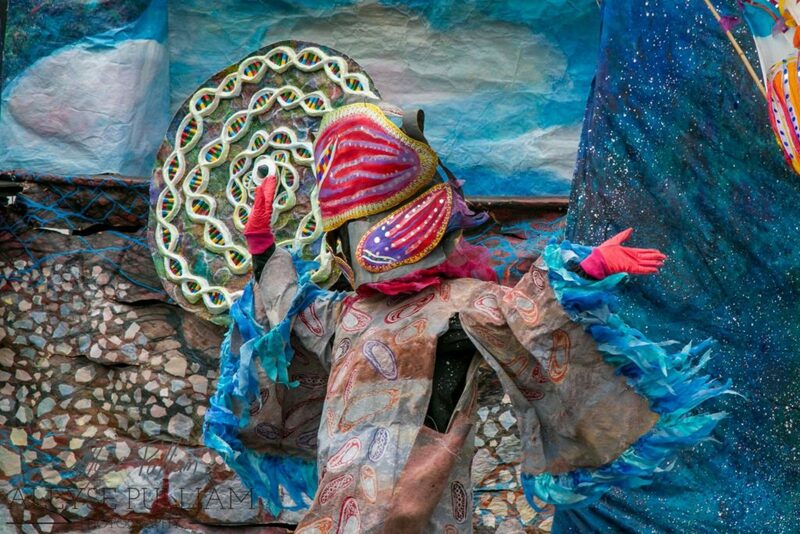 The Esopus Creek Puppet Suite is part of Arm-of-the-Sea’s Stories From Here initiative which seeks to creatively involve area residents in local history and culture. 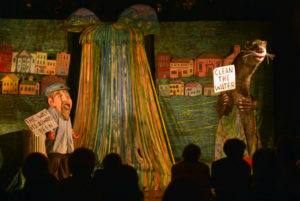 Elements of this show were created with students at Cahill School in Saugerties and Morse School in Poughkeepsie. 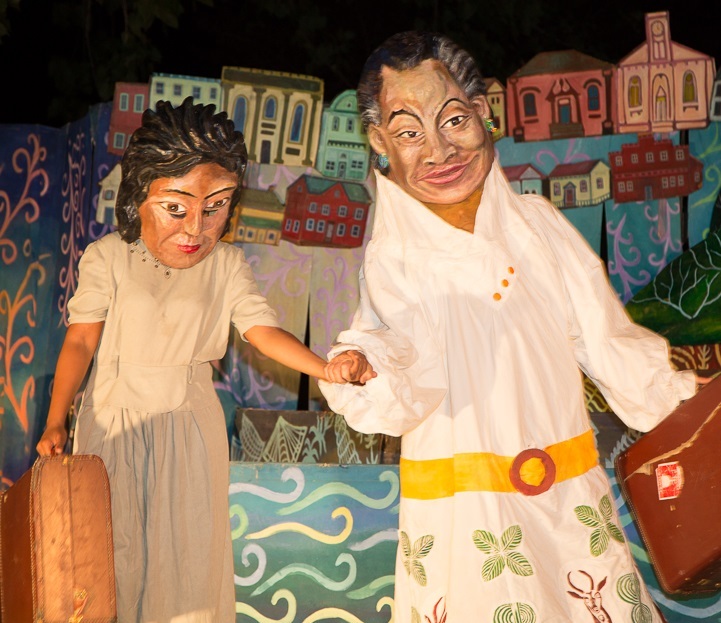 This Puppet Suite is the third in a trilogy of plays inspired by local history. It draws from events of the early 20th century and features entrepreneur Martin Cantine, street cleaner Peter Campanelli, and Harlem Renaissance artist Augusta Savage. The storyteller, Cornelius “Connie” Lynch, was a mason and proprietor of Lynch’s Marina, located just downstream from this park. The C. A. Lynch Fire Company, just up the hill, bears his name. We have taken outrageous poetic liberties to compress disparate events spanning 40 years into one cycle of the seasons. many civic contributions, Martin Cantine donated 31 acres of land to the Town, which became the Cantine Athletic Fields. After being a resident here for twenty years Augusta Savage returned to New York with her daughter and died in obscurity shortly thereafter. Today her role as artist and educator is widely acclaimed, and an art museum in MA and community center in FL bear her name. Pete Campanelli was known a Saugerties’ Ambassador of Good Will. When you walk the Village bluestone sidewalks, remember the man who swept those stones for thirty years. 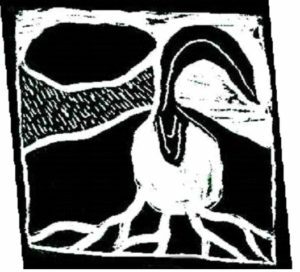 This project made possible with support from the Puffin Foundation and the Klock Kingston Foundation, And by public funds from the New York Council on the Arts, with the support of Governor Andrew Cuomo and the New York State Legislature. Use of Tina Chorvas Park from the Village of Saugerties Trustees. Food donations for cast meals generously provided by: Lucky Chocolates, ‘Que, Slice’s Pizza and Sun Porch Bakery. Please patronize these local establishments! In addition to the above contributors, our 2014 Season is made possible by support from: Hudson River Improvement Fund, Catskill Watershed Corporation, Stewart’s Shops, Macy’s, Price Chopper’s Golub Foundation, Hudson Valley Federal Credit Union, Saugerties Kiwanis Club and the TD Charitable Foundation. 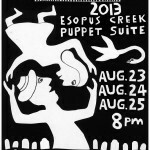 The 2013 Espous Creek Puppet Suite "> The 2013 Espous Creek Puppet Suite ~ A BEND IN THE CRICK OF TIME:True Tall Tales From Olde Saugerties ~ Aug. 23, 24 & 25, 2013 ~ Tina Chorvas Waterfront Park in Saugerties NY. 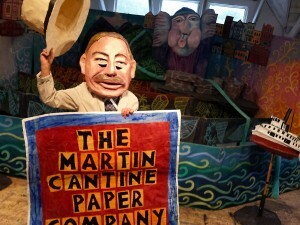 The 2012 Puppet Suite was entitiled UNDER MILL WHEELS. Press coverage available here and here. And you can view a three-part video of the show: Part 1, Part 2, and Part 3.